Strong, durable storage boxes are designed for frequent access and maximum stackability. 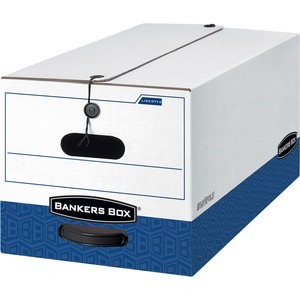 Maximum security box with string-and-button closure keeps your legal-size files secure, even if box is overturned. Reinforced plastic handle makes it easy to pull box off shelving. Storage boxes offer easy one-step, FastFold setup. Stacking weight is 850 lb. Legal - 8 1/2" x 14" Sheet Size - 2" Expansion - 2 x Prong B Style Fastener(s) - 2" Fastener Capacity for Folder - 2 Divider(s) - 18 pt. Folder Thickness - Pressboard - Manila - Recycled - 10 / Box"